So what's the first big news of 2013? 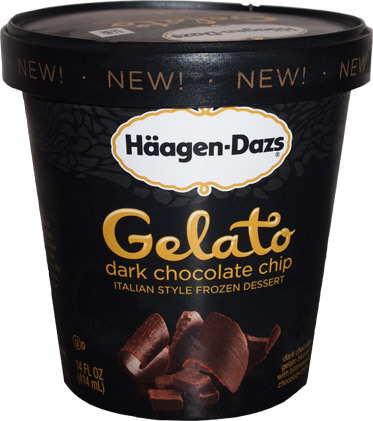 No, it's not Ben & Jerry's, it's quiet and reserved Haagen-Dazs that has taken the lead this year with their new lineup of Gelato! Who'd a thunk it? The infamously troubled five product line is going away and being replaced with 7 new flavors of gelato. We've got pints of black cherry amaretto, cappuccino, dark chocolate chip, limoncello, stracciatella and then there are pints and single serve cups of sea salt caramel and vanilla bean. That's a pretty fancy sounding line up but remember, Talenti has set the bar pretty darn high, so H-D needs to bring there A game. Now I've been on the hunt for these bad boys for the last fews weeks now and where do I finally find them? Walmart! I honestly wasn't expecting to find cappuccino and dark chocolate here. I did do a quick search through the back of the shelf hoping for more options but this is all that they had. Well, I do adore dark chocolate, so let's start there. I know I picked on Walgreen's new black packaging but that's because it tried too hard yet came up short. Here however, I kinda dig the black. All the traditional Haagen-Dazs elements are here, but tweaked to say "hey, I'm special". I don't have to think about what I'm getting, I don't have to squint to read the label, I just quick review my options, do a little happy dance, and get myself to the checkout lane. The inner seal is removed and I'll admit that I'm excited. I think I say this every time, but I really love trying new product lines and I hope this blog inspires you to try some as well. 5 senses up, it's time for the first bite. Ummmm, strange..... complex..... lots of dark chocolate notes because of all the chocolate chips. There's some kind of underlying flavor going on here though. I know it's probably cocoa, but it's unlike any frozen cocoa I've had before. Well it looks like haagen-dazs but it certainly doesn't feel like haagen-dazs. It feels so light and it's quick melting on the tastebuds (note I did not say creamy though). On the one hand, it's cool that they've made such a non-thick ice cream, but then on the other hand you gotta start thinking "well then why are there still so many calories in this?" There are so many chips, tons and tons and tons, though that makes it hard to decipher the base.... but I really like the chips here. They are the perfect size, they really are. I know I can complain about too thick or too thin or too soft or too hard sometimes, but not here, they nailed these chips perfectly. I know I should let it sit for a few minutes but I'm so hungry. This may be a weird way to describe it, but it's almost a bit like chewing a milk shake.... or maybe frozen mousse? It's so very hard to pin down. The good news is that I think I like it. I mean, sure the taste is throwing me for a loop, but no part of me wants to stop. I still can't tell what that underlying taste is, but it's something. Is it earthy maybe? You know, I keep forgetting that it's suppose to be dark chocolate. It's much more complex then that. At least I think it's complex because I can't seem to process what I'm tasting. Alright, I need to stop, it's almost dinner time. Hmmm, there is a very weird aftertaste. It's the same as the taste before, but now there is nothing else going on to distract me from it. What a strange first encounter. Oh, it's not a bad product, and H-D tried hard like they always do, but instead of going "hey, try this, it's awesome!" I want to say "hey, can you try this? I can't quite tell what's going on". On Second Scoop: It was definitely a unique experience last night so I'm wondering how things will go when I have a much different mindset (and no headache) --- good news and bad news. The good news is that I still taste something that I can't put my finger on. It kind of reminds me of those super fancy six dollar bottles of chocolate milk at whole foods with their super fancy Belgium chocolate taste (not that I buy them, I just stare and go "yeah, way too much moola" [sorry]). It's that fancy taste in this pint that keeps telling your brain to eat more and more, and frankly, you should, because the bad news is that when you stop eating that funk is going to hit you hard. Sometimes a flavor will make me a little thirsty or crave something salty, but this aftertaste makes me want to, iunno, I'm at a loss for words on this one. I want you to go out and try it if only so you can report back what you think. 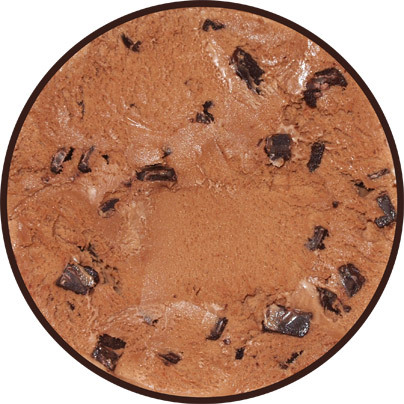 Final thoughts: Looking over the almost three year old review of Talenti's double dark chocolate gelato, I suspect I'm having the same kinds of confusing thoughts as I did then. The difference is that I don't ever remember thinking of Talenti as having a "light" texture, though H-D isn't as super light and creamy as Archer Farms gelato. I just tried the Sea Salt Caramel. Different from Talenti because it has a big wad of caramel running through it. Good, though, but melts fast. I just had the Straccitella and man was it a dud! 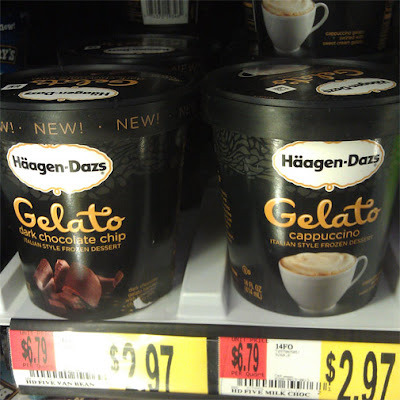 I wanted the dark chocolate chip, sea salt caramel, or Limoncello but Walmart had everything but :( The chocolate shavings were so prevalent you couldn't sample the base at all. While I was eating it, it actually didn't taste like anything other than a mild chocolate chip taste. Double boo on this one! I also noticed the nutritional facts were high which struck me as odd considering it's gelato. I tried the Straciatella (I would have tried the Dark Chocolate Chip, but it wasn't available at my store.) I too am put off by the high calorie count, 270 calories!! Gelato is supposed to be lighter and less calorific than ice cream. Just for comparison, Talenti has only 200 calories. Even Ben & Jerry's Chocolate Therapy has fewer calories at 240 -- guess which flavor I'm going to buy! I just randomly picked up the cup sized one at a Walmart recently and had to go back for the pint. I loved the dark chocolate chips and the base! even my mom who never eats ice cream ate this, I was shocked. Would definitely recommend.